Parking: There are many pay and display car parks in the centre of Whitby (grid reference NZ 899 110). Start the walk on the bridge over the River Esk. Leave the bridge in an easterly direction towards the Abbey high up on the hill ahead following the road initially past the Dolphin public house, then around to the right. Follow along the road with the river to the right, and shortly after the car park turn left climbing the steps up Boulby Bank. Follow the cobbled steps up between the houses, keeping to the right hand path after a further one hundred yards, and continue on out on to the road. Turn right along the road, heading away from the sea behind, with the River Esk down below to the right. Keep on the road past St Hilda's Business Centre and go straight across at the T-junction following the sign for Folly Gardens, initially on a metalled road, then after about twenty yards, head along the narrow flagged path directly ahead which keeps to the left hand side of a fence for about two hundred yards before entering out on to a road. Turn right along this road and shortly afterwards pass through the middle of a few houses and then through a farm. As the road bends around sharply to the left in the middle of the farm, continue in a straight line ahead by passing through a wooden kissing gate attached to the side of a barn. Follow this path alongside the wall to the right for a few hundred yards, then continue ahead alongside a small hedge until the path eventually enters out on to a road. Turn right along the road for about half a mile heading towards the small cluster of houses on the horizon ahead, ignoring the turn on the left for the caravan site. Behind there are views back towards the Abbey. As the road starts to rise, turn left by a telegraph pole where there is also a green sign for a public bridleway and a white sign for Whitby Lighthouse. There are also the names of various other buildings down this lane carved in to a stone by the turning: Brook House; Haggitt House; High House and Ling Hill. Follow this lane in the direction of the sea towards the farm buildings about one hundred and fifty yards ahead. Keep on this road which bends around to the right by a slurry tower and continues on past the right hand side of the houses about a further one hundred yards ahead. Keep on this road past these houses, initially flanked on both sides by grassy banks before flattening out. After a further third of a mile the road, shortly after assign another few cottages, bends sharply left and heads downwards in the direction of the sea. Ahead now is a building with a very large foghorn on it. Pass this and just before the entrance to the lighthouse, turn left over a stone stile to join the coastal path, which is part of the Cleveland Way. This coastal path is now followed for about two miles all the way to the remains of the Abbey. The path initially goes around the right hand side of the building with the foghorn on it. The path keeps very close to the cliff edge for most of this return journey and excellent costal and cliff views are afforded for most of this return leg. It is wise though to keep to the path as there are sheer drops off the cliff top in many places. Parts of the path can become very muddy after prolonged wet weather. The path passes over two wooden stiles and continues ahead towards the campsite now directly ahead. Go over the stile just before the caravan site and turn right along the road through the site, passing the reception buildings. Continue ahead keeping to the right of all the caravans and after a few more yards the coastal path becomes visible ahead. The path leaves the metalled road following a brown sign for "Footpath to Whitby". Continue now on this gravelled path in the direction of the Abbey and turn left just before reaching the radio mast and follow the path the short distance out on to the road. Turn right and follow the road around to the turning area in front of the Abbey. 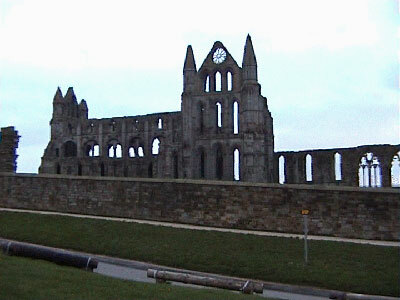 A detour can be made here to visit the Abbey itself, which is administered by English Heritage (www.english-heritage.org.uk). Successive generations have been drawn to the headland location as a place of settlement, religious devotion and literary inspiration. Archaeology has revealed evidence of prehistoric and Anglo Saxon settlements. It has been the burial place of kings and a training ground for saints. Founded by St Hild, the Abbey made history in 664 when the Synod of Celtic and Roman Christians reached an agreement on the date of Easter. It became the focal point in the landscape in the 17th century when the prominent Cholmley family bought the ruins and surrounding land after the dissolution of the monasteries and built a mansion alongside. There is a small charge for entering the Abbey. In the right hand corner of the turning area, take the path down which leads through the edge of the churchyard and then down the 199 steps to the cobbled street below. The cobbled street bends around to the left and after a further one hundred yards enters out on to a road. Turn right on to the road and follow it for the few yards back to the starting bridge.